Brilliant cut rubies are complemented with sparkling brilliant cut diamonds weighing a fifth of a carat in this beautiful half-eternity 18ct yellow gold ring. The perfect symbol of your true love and commitment, this beautiful ring will take your loved one's breath away. 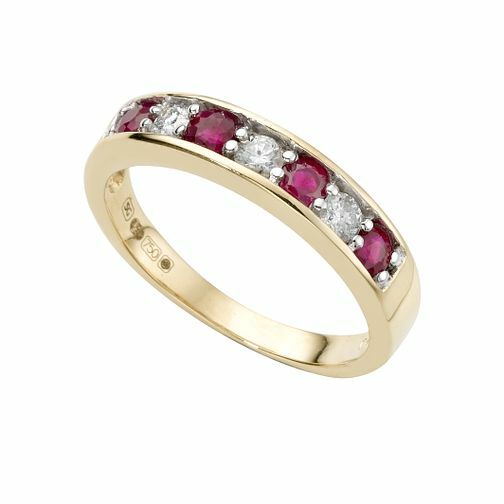 18ct gold ruby and diamond fifth carat half-eternity ring is rated 5.0 out of 5 by 6. Rated 5 out of 5 by Anonymous from Subtle quality A beautiful ring which has been much admired by my wifes friends. Bought to replace a lost ring, more than happy with the replacement. Rated 5 out of 5 by Anonymous from Lovely ring A little late in arriving,possibly due to bad weather,but not a problem.Lovely ring. Delighted with purchase.Customer service staff all very helpful.